FOLLOWING two successful Once Upon a Time in Sunshine promotions within the past year, Taylors Hill promoter and undefeated professional fighter Jake Ellis is at it again. Ellis has gathered some of the best fighters from across Melbourne’s West for the 30 May show at Sunshine’s Italia Club, where three titles will be put on the line. The main events will include Altona’s Anthony Buttigieg’s battle with Franco Valenzuela for the light middleweight Victorian belt. Footscray’s Sylvia Scharper will also be in action against Queenslander Kori Farr for the Australian bantamweight title, while Werribee’s Marc Pante will vie for the light heavyweight Victorian title against Joe D’Angelo. “The card speaks for itself,” Ellis said. “I went from basically not having any titles on any of my shows to having three on the same show and an Australian title being one of them. “With my main events both boys are undefeated and the vibe in the crowd is going to be electric. Pante, 33, is undefeated with three knockouts since going professional and is feeling good a month out from his upcoming bout with D’Angelo. “I’m pretty happy with the way I’m going at the moment,” Pante said. “Training’s going well, so hopefully I can get another victory under my belt and stay undefeated. Ellis talked up the bout as Pante’s toughest yet. “I think undeniably it will be Marc’s hardest fight,” Ellis said. “On paper and in reality it is his hardest fight. It’s a fight for the championship of the state so it goes without saying. “Size-wise and even overall frame-wise (D’Angelo’s) very similar to Marc, short and broad and he has a very extensive kickboxing career and Marc’s also got a kickboxing background as well. 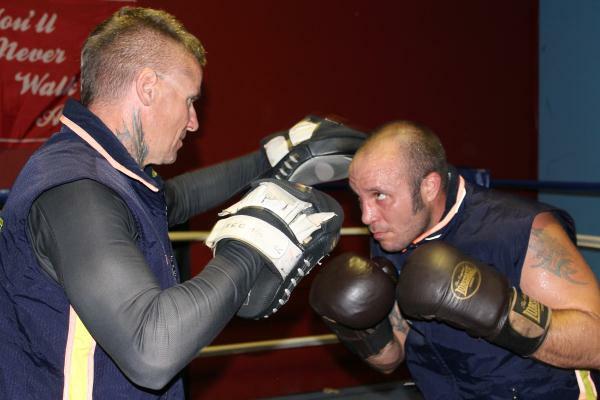 Many of the fighters that will take the ring at the Italia Club train under Dave Hegarty out of the Tarneit Boxing Gym, including Dwight ‘The Cowboy’ Ritchie.